When some of the richest men in America, including John Jacob Astor, realized in the 1890s that the New York Central, Lehigh Valley, Erie, and Delaware, Lackawanna & Western Railroads passed through a one-mile corridor, they began planning a community. In 1892, the renowned firm of Olmsted, Olmsted & Eliot designed a residential development surrounding manufacturing facilities. 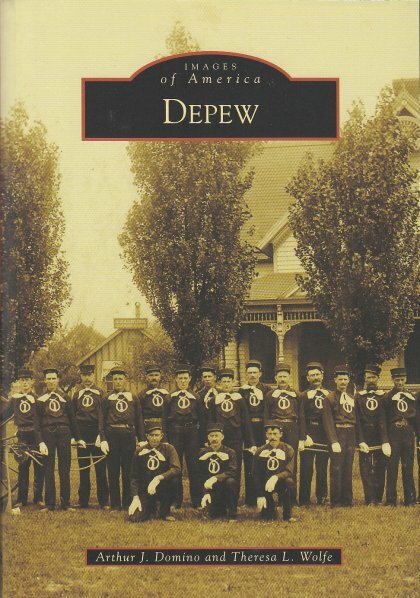 In 1894, it was incorporated as the village of Depew. The first tenant, the New York Central Locomotive Works, attracted a number of railroad-related industries, and Depew continued to grow until advances in technology and the Depression caused the New York Central to withdraw in 1931. Gradually, others such as Magnus Metal, National Battery, and Symington-Gould were phased out. Depew would never become a vast industrial complex as first planned, but today, the village is a mixture of residential and commercial development..
Arthur J. Domino (former Depew fire chief, former mayor of the village of Depew, and current village of Depew historian) and Theresa L. Wolfe (past president of the Town of Lancaster Historical Society) have a passion for preserving the village’s history. The photographs featured in the book are from the collection of the village of Depew historian, the Town of Lancaster Historical Society, and from various local residents.